Also mentioned in the linked Mother Earth News article is the affinity deer hold toward the winter peas and how they can be a major pest. An important concept I hold that is backed in no science whatsoever is that wildlife prefer to harvest food where they feel safe. Following that logic is the reason brushy areas are maintained to satiate predators and prevent chicken kills as well as growing a food plot of austrian winter peas for the deer so they stay out of the garden. Deer prefer to travel and forage in “edge areas” which are transitions from pasture to forest. A small field persists in the midst of my forest as shown below. I’ve struggled with how to use this clearing productively. My dad and I have tried without much success to grow deer plot mixes in the past. We tried conventional soil treatments of lime and fertilizer but the only things that ever germinate are turnips/radishes that die at the first frost anyway or get overgrazed resulting in bare soil for most of the winter. Growing a plot of austrian winter peas seems like the best use of this clearing until a more permanent use is developed. 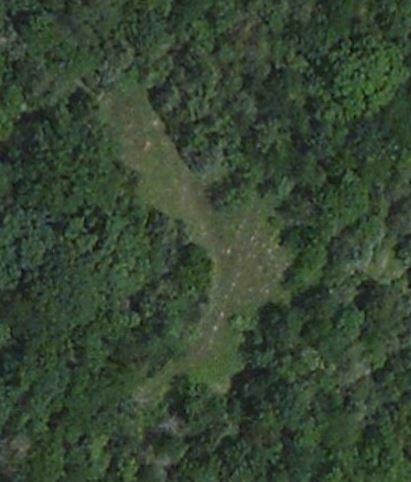 Additionally “An oblong or crescent-shaped plot yields maximum edge where the plot and the forest meet” which makes this little piece of pasture an ideal location for a wildlife plot. The destructive nature of tilling and wasted energy put forth to seed production are the main reasons I typically avoid annual plants. However with proper management, annuals can be a useful tool in sustainable farming. If a straight north-south line is drawn through the pasture pictured above, it lies at a convergence of older growth oak forest to the west and relatively young cedar forest to the east. Persimmon trees line the eastern edge of the pasture. Therefore my plan is to set up temporary pig pens in the field. Pigs will be allowed to extensively root up the turf in the field while harvesting tree nuts and pasture roots. Each time the pigs are rotated to a fresh paddock, some mixture of ground cover and corn will be planted and mulched with old hay on any bare soil to prevent erosion. Throughout the summer the pigs can be rotated back through to harvest the corn at any stage of its growth, which swine relish, while simultaneously tilling in the straw mulch. For the final rotation of the year, pigs will be allowed to extensively root the ground eliminating as much competitive vegetation as possible. Deer (as well as other wildlife) will be the primary consideration in the final planting of the year. As each paddock is vacated for the year and the temporary fencing removed, the replanting will consist of a mix of austrian winter peas and grains and/or clovers. As little success has been achieved in the past on this land with clovers, Rye will be the starting point as a companion to austrian winter peas with consideration given to red or crimson clover based on this website’s guide for dry area winter plantings. Through intensive rotational grazing management consisting of mulching and annual crop plantings, hogs will receive their natural diet (although supplemented with feed) in their natural habitat while increasing organic matter in the soils as well as prepare the ground for wildlife food plotting.